Nothing says spring more than a bouquet of fresh spring flowers. Why not bring a splash of spring to your springtime celebration with a cake decorated with edible flowers? What could be prettier than a Mother's Day, Easter or birthday cake decorated with pansies or violets from your flower garden? There are many edible flowers, but not all flowers are safe to eat. Do check my chart of some of the most common edible flowers before incorporating them into your cake decorating. Many common flowers are edible and can be used in salads, as infusions in vinegars and oils or in jams and jellies. Others are best candied or used fresh as decorations. Flowers that are listed as edible are not all suitable for use on cakes and desserts because of strong flavor. Also, some flowers will have undesirable effects if eaten. For example, the day lily is considered edible and makes a pretty decoration, but it can act as a diuretic or laxative. It’s best to reserve them for decorative uses only. *Note: See the table at the end of this article for a list of some of the most common edible flowers perfect for use in cake decorating. First, be certain that flowers are edible and that they are free of herbicides and pesticides. Remove any insects that might be on them. In this case it is best to use flowers that you have grown yourself. Wash the flowers by placing in a shallow bowl of water and gently submersing and swishing around to remove dust, pollen and any insects. I like to leave the flowers in water for a half hour or so to hydrate them for longer lasting freshness. Remove from water, cut stems off the flowers close to the base of the flower, then place on a paper towels to dry. Plan design by laying out on a paper or clean paper towel so that you can see how the flowers will look together. 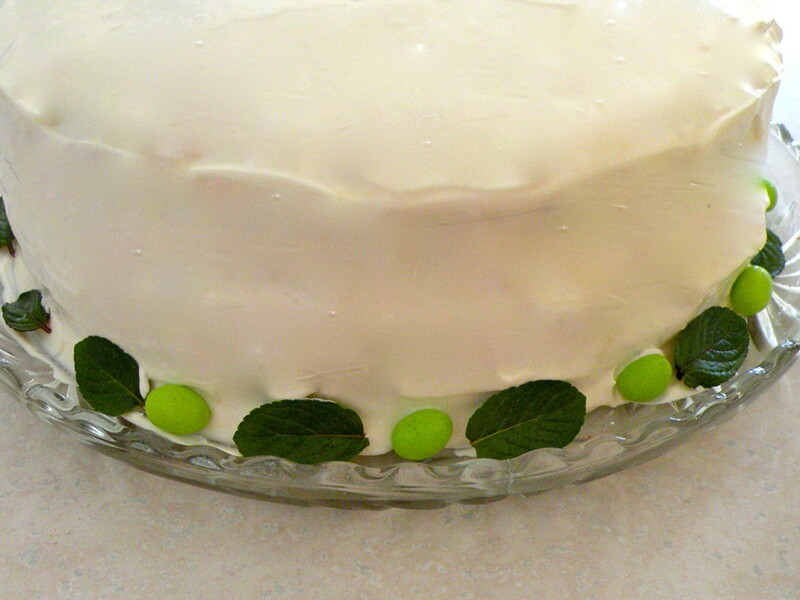 Start by alternating mint leaves with jelly beans or other small candies around the bottom of the cake. A border at the bottom will give the cake a finished look, and the candy colors can be coordinated with the flower colors. Start on the cake top, working from the center out. 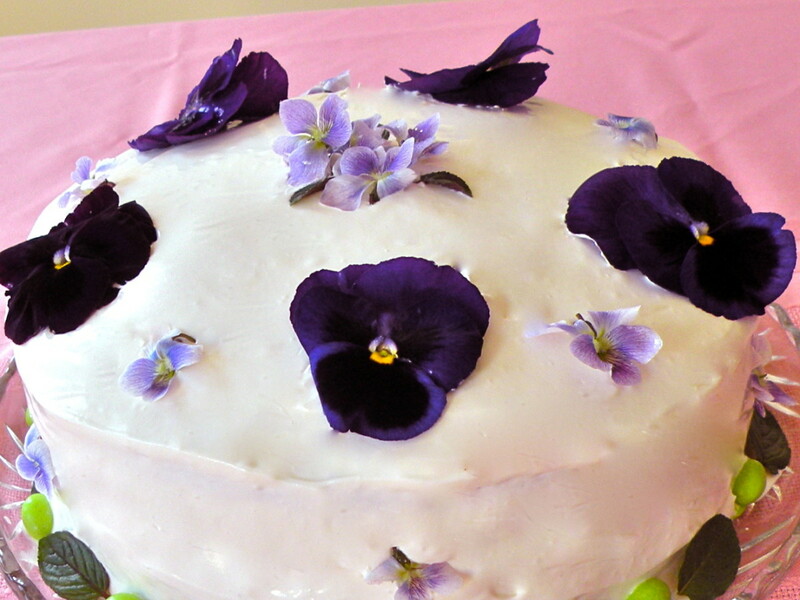 On the pansy and violet cake, I started with a cluster of five or six small violets in the center and used a few mint leaves to finish off the center design. Five pansies are evenly spaced around the edge of the cake top. If you are a perfectionist, you can measure space between flowers to be sure that they are evenly spaced. I didn't measure, just estimated distances as I placed the flowers. 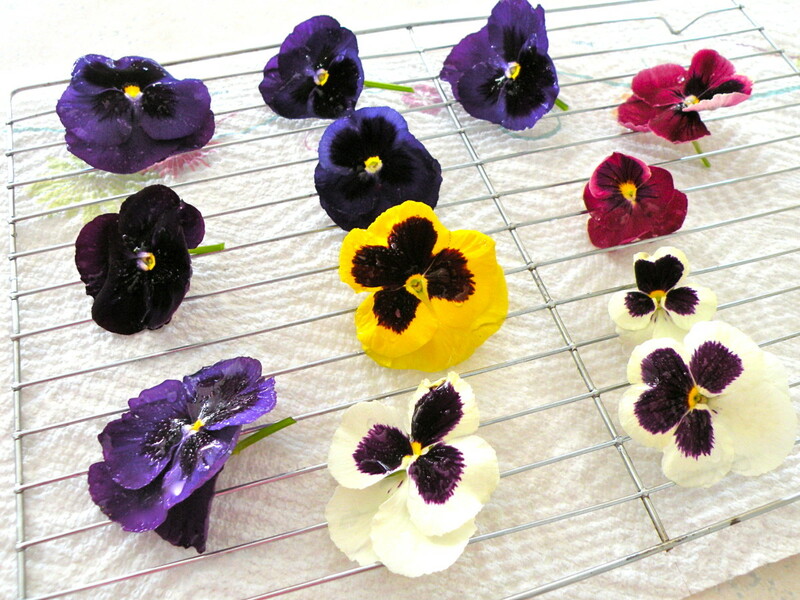 A violet with stem removed is placed between each pansy. The sides of the cake need some decoration, but I didn't want to detract from the top, so I placed a violet under each of the edge flowers about halfway up the sides. This gave the cake a finished look. Tips for success: Frost cake and chill in the refrigerator for about 30 minutes prior to decorating. This will help keep the icing from wilting as you work if your kitchen is warm. If you won't be serving the cake until the next day, place it in a covered cake dish and refrigerate to keep the flowers fresh longer. Pictures below show some other ideas for decorating with flowers from your garden. 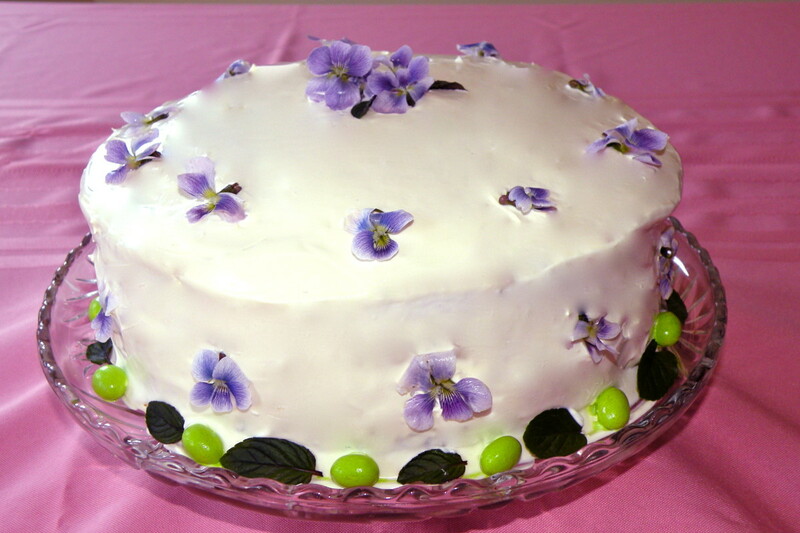 I particularly like the cake with the white icing and the violets as the violets in my lawn are a sure sign of spring. Johnny-jump-ups would also be pretty as they are small and come in many pretty colors. The yellow and purple ones would be perfect for Easter or Mother's Day! 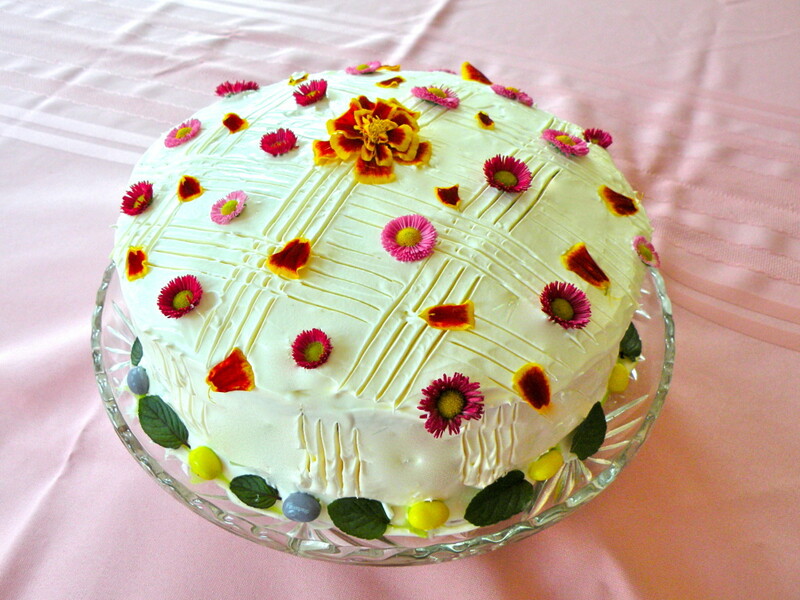 I happen to have English daisies, and love the way they look scattered on the cake top. In place of mint leaves, one could use new leaves of roses as long as they haven't been sprayed with pesticides. Be sure to wash leaves and flowers thoroughly to get off any minute insects that might be hiding on them. Not every flower is edible - be sure to double check for safety before using as a garnish or component in your dishes. 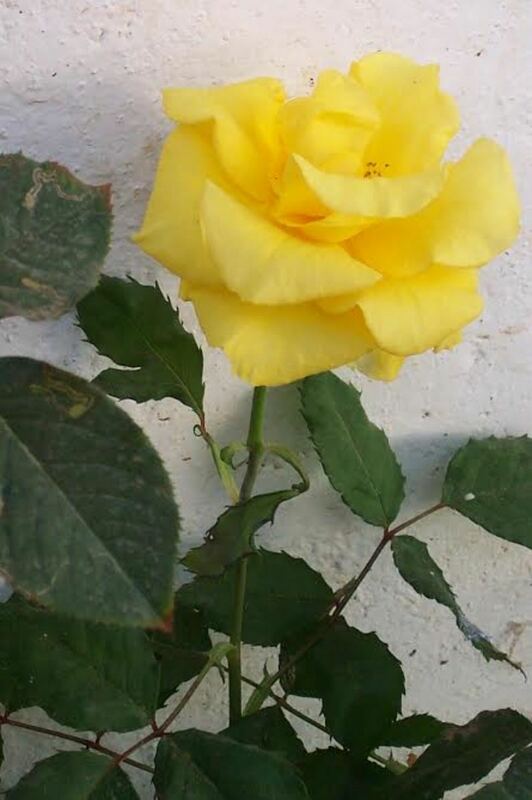 Never use any flower from a plant that has been treated with pesticides. Never use roadside flowers as they could be contaminated with herbicides or pesticides. Never use flowers in food from a nursery, florist or garden center as they could be contaminated with herbicides or pesticides. WARNING! These flowers are poisonous! Be sure to check the table below for a list of edible flowers that are safe to use as garnishes and decorations on food. If in doubt, use something else! 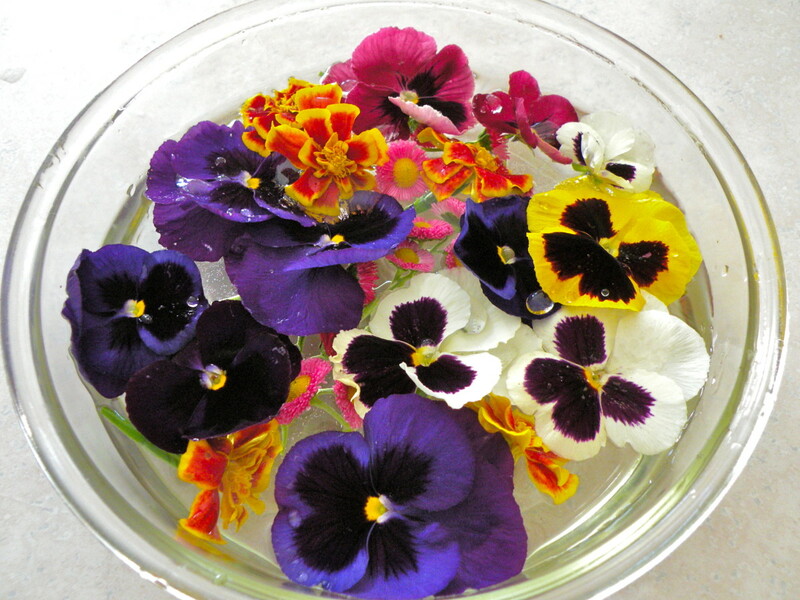 The list above is a small selection of edible flowers that you may find in your garden. In addition, herbs and most of the flowers from herbs can be used in food decoration. 1 cup of superfine sugar (whirl regular granulated sugar in a blender for a few seconds to create superfine sugar). With a fork or whisk, mix egg white and water together till slightly foamy. Spread sugar in the shallow dish. With the paintbrush, paint each flower petal with the egg white mixture. Hold flower over the top of the sugar dish and sprinkle sugar onto both sides of the flower. Gently shake off excess and place on wax paper to dry. Air dry for 12 to 36 hours or speed up drying by placing in a warm oven (150°F) for a few hours. Flowers need to be totally free of moisture before storing. Use immediately or layer in a plastic container with wax paper between layers. See if you can "borrow" a few blooms from your neighbors and friends. It doesn't take many flowers to decorate a pretty spring cake. Check your houseplants. Begonias and geraniums are common house plants that have many blooms and are safe to eat as long as you haven't used pesticides on them. But only use them if they've been long-time residents in your home. If you get them straight from the greenhouse, they're very likely to have pesticides on them. Look for local farms that have organically grown produce. They may also have organically grown flowers. Go for a walk in the woods. 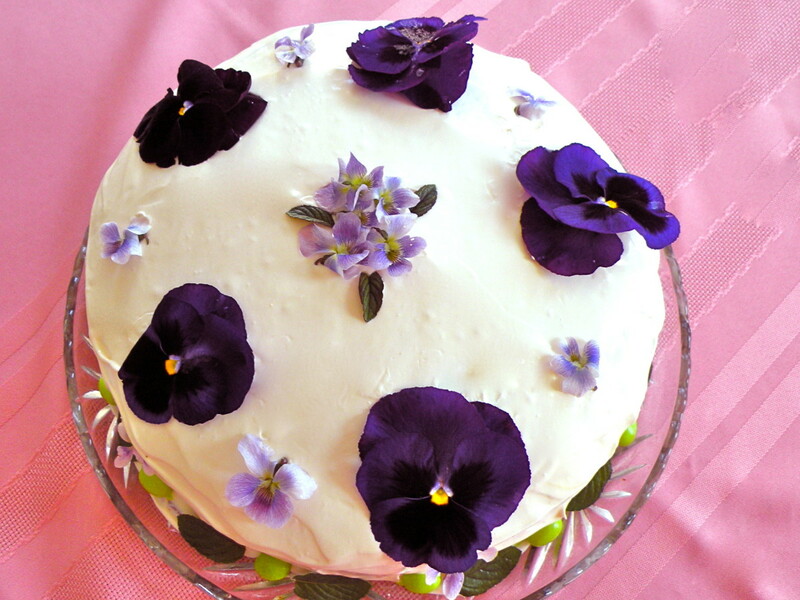 One of the prettiest flowers for decorating cakes is violets, and they are also one of the most commonly found. Chamomile and young dandelions are also commonly found in grassy areas. Again, do not pick anything that may have been sprayed. Check with your florist for edible flowers. As some restaurants used flowers as garnishes on food, florists may have a source for organically grown edible flowers. You can purchase candied flowers from sources like Amazon.com and eBay or cake decorating suppliers. One of the reasons I love to decorate food, especially cakes and desserts, with flowers is because I love to use flowers from my flower garden. 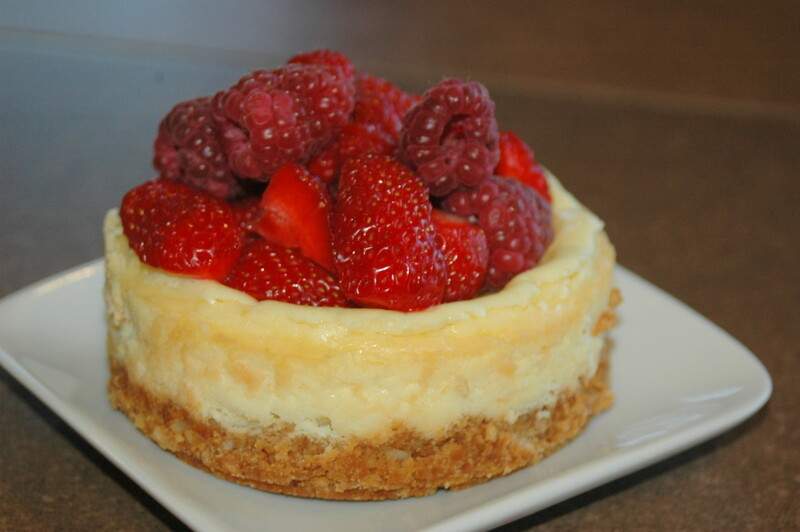 It's so rewarding to use the flowers I've grown myself to enhance the foods, cakes and desserts I prepare. 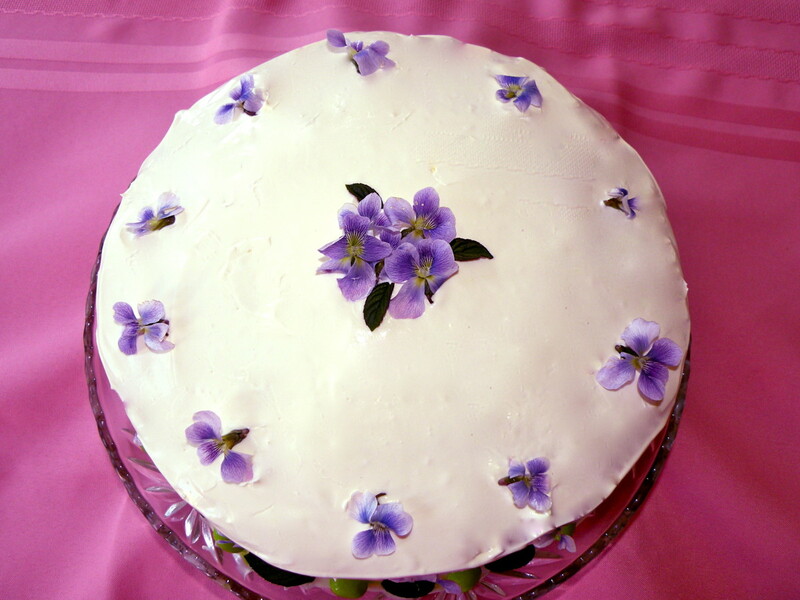 It's especially fun in the early spring to go out and hunt up some violets, dandelions or pansies for those special occasion cakes - a great way to kick off the season! 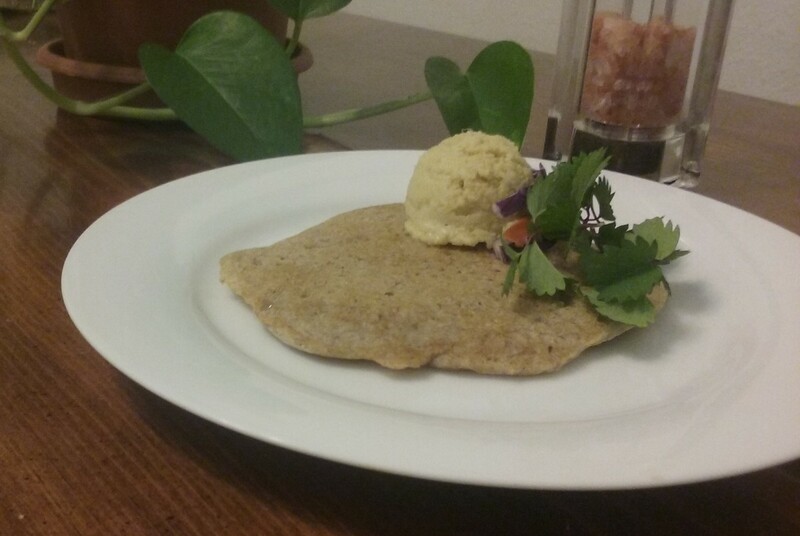 Have you used edible flowers in food preparation? Yes, I've used edible flowers for cake and cupcake decoration. Yes, I sometimes use flowers as a garnish or in salads. No, I've never tried this, but I'd like to! Enjoy Your Beautiful and Unique Cake! You can see that decorating a cake with fresh flowers is not only easy but impressive. Decorating with fresh flowers will dress up cakes for any occasion. Fresh flowers add a beautifully elegant touch to special occasion cakes on birthdays, anniversaries, Mother's Day, Easter, showers or weddings. Do give it a try! Thanks so much, Audrey Howitt! It was also one my most fun hubs as I played with the different flower decorations. Maybe your best hub ever! Just gorgeous! Thank you, Daisy! I am very pleased and excited about this, and do appreciate all of your encouragement and inspiration along the way! I see that the page views for your Hubs has passed the one million mark. Congratulations! What an impressive accomplishment! This fresh flower decoration looks so beautiful! I have never tried it on cakes but I do make some sweets with fresh rose petals. Excellent presentation and suggestions. Lovely pictures, voted up and pinned! Daisy, I think that cupcakes would be beautiful decorated with fresh flowers! Thanks for commenting and for sharing! I am once again inspired to decorate a cake with fresh edible flowers. I think my favorite is the violet pictured here. This would really impress guests at any event! Your cakes are gorgeous! The next time I bring a dessert to a party, I think I'll bring a platter of flower-decorated cupcakes. Bac2basics - I think you'll find decorating with fresh flowers to be easy and fun. Your sponge cake sound like the perfect candidate for this kind of decoration. Thanks so much for the link and for your comments! Wow these cakes look gorgeous and I am going to decorate a cake this way very soon when I have friends coming to visit. I have lots of Pansies and Marigolds in flower right now. Voted all the way up and I hope you don't mind me linking it to a hub of mine which is a very easy sponge cake recipe, which you can create many different types of cake from. Coming in to read again and the cakes still look wonderful! Thanks for sharing, Stephanie, and I share the cake too! Vellur - Thank you for your comments on my hub about Spring Cake Decoration Using fresh flowers! Glad you enjoyed it! Awesome hub, delicious and beautiful. Great hub, Voted up. Athlyn Green - I'm so glad you liked my spring cakes with fresh flower decoration! The pansies in my flower bed are blooming just in time for me to use a few to decorate my Easter cake! Hope you will give it a try, too. Hi Stephanie, you did such a wonderful job on your cakes, so very beautiful. I hope this hub does well for you, with the amount of effort you put into it. Awesome! Athlyn Green - I'm so glad you enjoyed my article on cake decorating with fresh flowers. I hope you will try it soon! Thanks so much for your comments and for sharing on FB! Oh my! What an absolutely fabulous hub. I've FBed it and will share it at other places. Your photos are outstanding. Levertis Steele - Using flowers on your spring cakes will add a festive touch! Do give it a try! What great ideas! I must try decorating my next cake with flowers. Thank you, AudreyHowitt! This cake is so easy to decorate for a special day.Thanks for commenting! So very beautiful! What a great hub! Pamela99 - This is such an easy way to make an elegant looking cake...do give it a try! Thanks for stopping in to comment and share! Hi Denise - This is a great way to decorate Easter cakes. Don't be afraid to give it a try? The worst you can do is mess up the icing, and then it's just a matter of taking off the flowers, smoothing out the icing and trying again. :) Thanks so much for stopping in to comment and for sharing! The cakes are beautiful and I would love to try to use flowers to decorate cakes. I have marked this hub for future reference. Voted up, awesome and shared. I thought for sure I had previously commented on this awesome hub, Stephanie, but apparently not. I'm so impressed with the whole thing. Not sure which I liked more - the beautiful photos or the actual end product. I'm not quite brave enough to give it a try, but one day, perhaps. Bravo-UP/U/I / B/ A Loved it! I'm sharing. Kathryn Stratford - I'm glad you enjoyed these ideas for decorating a cake using fresh flowers. I love doing this when I have my home grown fresh flowers - it's easy and safe! Thanks for stopping in to read and comment! That is so pretty! Thanks for sharing this information. I would have never thought of decorating a cake with the different types of flowers. DanaTeresa - I'd love to see pictures! OH I LOVE CUPCAKES! I am going to have SO much fun with this! Dana Teresa - This is an easy and very elegant way to decorate a cake. If you don't want to bake a big cake, why not try decorating some cupcakes with fresh flowers? That would make a pretty little treat for a tea party or coffee with friends. 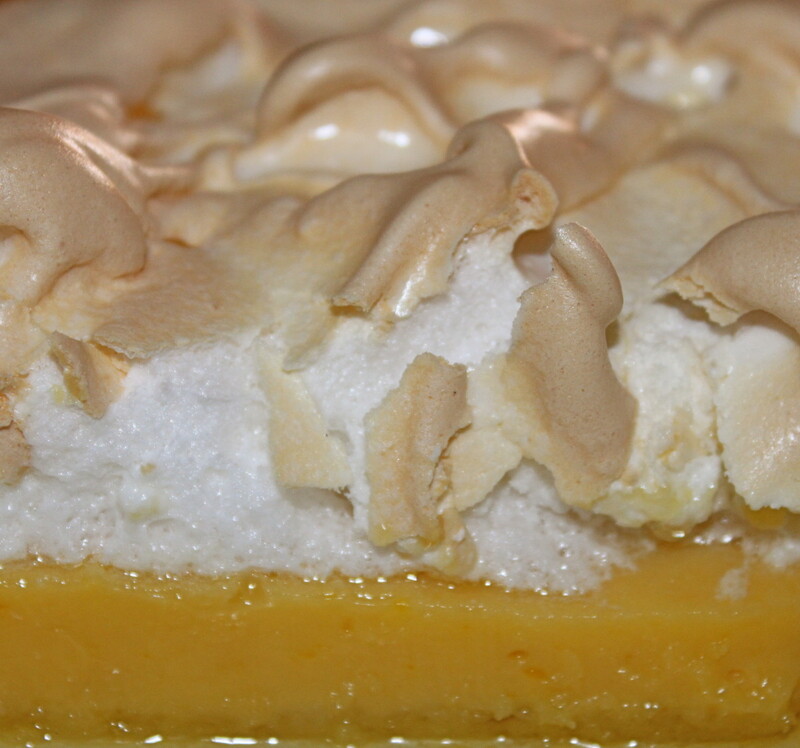 Thanks so much for stopping in to comment...happy baking! Wonderful, gorgeous and delicious. Thanks for sharing, Stephanie! This is great! I cannot believe I never thought to decorate with flowers. You make it look so simple! This is perfect for people like me that aren't so great at icing art. A real flower looks worlds better than anything I could ever make!... Now I just need a reason to make a cake! AudreyHowitt - What a beautiful wedding cake it must have been decorated with fresh flowers! I love that idea! StephSev108 - So glad you liked my fresh flower decorated cake. It is a lovely combination for any occasion! Mike Robbers - Thanks for stopping in to read and comment! Glad you enjoyed my cake decorated with fresh flowers. They are lots of fun to do, and very pretty, too. This a wonderful hub...fresh flowers and cake. I love it. Thank you Stephanie for this wonderful inspirational hub,, voted & shared! Ohh...deliciously beautiful. Thanks for sharing it, Stephanie! We'll need you to bake us some cakes now!! Hungry, and sharing! Les Trois Chenes - Fresh flowers are perfect when they are in season, but I also like the idea of preserving their beauty by crystallizing them. You have a great article on that and I was pleased to link to it. Thanks for visiting my hub and for link! Sally's Trove - Many flowers look good enough to eat...and they are! But I have to admit that I like flowers more for their decorative aspect than for their flavor. :) Yes, wouldn't it be lovely to go RVing in France? Thanks for your comments and for the pin! Did you make all these cakes yourself? What a lovely idea. Never thought to use fresh flowers on cakes! Many thanks for the link to my crystallized flower article, (brought to my attention by a mistake by Sally's Trove). Beautiful hub! We don't think enough about the culinary aspects of edible flowers, and your hub showcases how rewarding flowers as food can be. The link to Les Trois Chenes is wonderful. Maybe you will be RVing there some day? :) Pinned. Happyboomernurse - Thanks so much for stopping in to read and comment on my article on cake decorating using fresh flowers. As you know, I do love flowers and usually have some edible flowers that can be used to decorate a pretty cake. It is best to check the charts to be sure that the flowers you plan to use are safe, though. Thanks for the votes and the share, Gail! Sharyn's Slant - Thanks so much for your very kind comments, Sharyn! I think decorating with fresh flowers is a lot easier than some other methods as long as you have a few edible blossoms growing in your flower bed, and they lend an elegant look to your dessert table. Thanks for sharing! What a great idea and I love the beautiful layout of this comprehensive hub, the photos and the great tips and factual information about which types of flowers are safe to use. OMG Steph, this is absolutely gorgeous. I never saw this hub before. So talented you are. The information you shared is just awesome. I used to try decorating cakes and came up with some that looked pretty good but I got away from it and all my cool cake pans are sitting in storage. This really makes me want to bring them out again. Definitely sharing this!!!!! Mandeeadair - Fresh flowers do make a special occasion cake even more attractive - hope you enjoy using them in your decorating! Thanks for your comments! Wow, this is amazing. Now I want to go back a cake :)! I had no idea about the edible flowers and I am anxious to try it out. Thank you for the informative, well written hub :)! AudreyHowitt - Glad you enjoyed my hub on cake decorating using fresh flowers. With so many flowers in bloom right now, it's a great time to try it. Very cool! The cakes are just lovely!! Thank you for this informative hub! Carmen H - Wow, Carmen, your comments sure boosted my ego! I'm so glad you enjoyed the cake with fresh flower decorations. I'm thinking it would be great for Mother's Day, too, especially now that there are more flowers blooming. Thanks so much for your very kind comments - they always make me smile! RTalloni - I've been decorating cakes for years, and only recently realized that fresh flowers were a wonderful, natural and edible decoration. I'm glad you enjoyed my examples! Thanks for visiting and for the comments! No nicer cake designs around. I'll never forget my du-uh moment when I first saw fresh flowers being used on cakes. Thanks for a great resource on decorating cakes with fresh flowers! Your examples are beautiful! Pstraubie - The bees just hadn't discovered those flowers, yet, I guess...hahaha! Thanks for stopping in to read and comment! Thanks for sharing this....they look to lovely to eat and how did you keep the bees away??!!! Love this...will definitely considering giving these a try. Hi Thelma - It must have been wonderful to have all those beautiful tropical flowers when you lived in the Philippines. I'm not sure if the ones you mentioned are edible or not, but they would surely make beautiful decorations. Thank you for coming by to comment! Wow! I love the photos Stephanie. I used to decorate my cakes with fresh orchids, bougenvillas and other flowers from my garden in the Philippines for a change but not always as I pitied them when I harvested them for a cake decoration. They looked lovely. Thanks for sharing this. Voted up and great hub. Made - I know it's a little early for some people to find fresh flowers in their backyards, but do keep this in mind when spring arrives in your area. Thanks so much for stopping in to comment and vote! Turtlewoman - I'm so glad you found the chart of edible flowers useful. I tried to list flowers that are more common and easily found. Thanks for the bookmark and the votes! I love this hub! Your cakes look so beautiful. I would really like to make a cake and decorate it with flowers. This hub needs to be bookmarked, and I'll come back to read it when I'm on my way to haunt edible flowers. I still need to wait a couple of months to look for flowers, because we still have snow here. Voted up, useful and beautiful! What a beautiful cake. Thanks for creating the chart of all the edible flowers that we can use. Bookmarked, and voted! Glad you enjoyed my hub about decorating a cake with fresh flowrs. It worked great for an Easter cake, but fresh, edible flowers would also be lovely on a Mother's Day cake or other special occasion cake. Thanks for stopping by to commet! Real flowers are easy and an elegant touch for a special occasion cake. 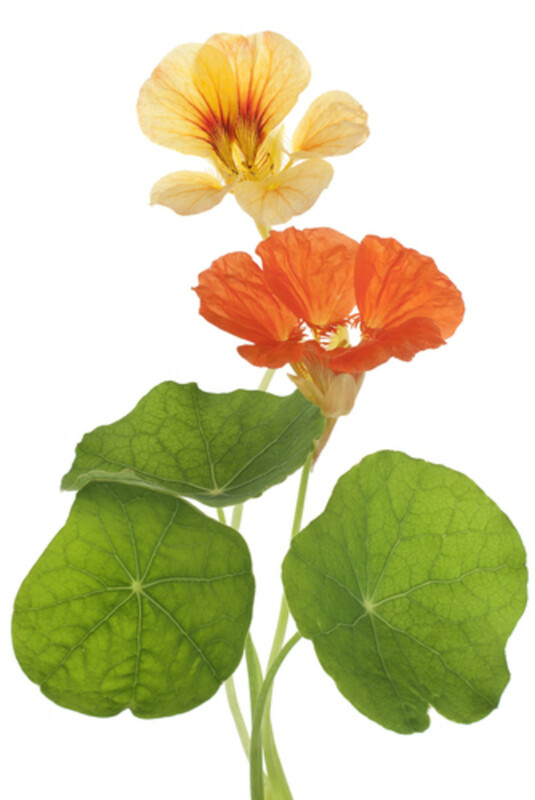 If you grow any of your own flowers, you're likely to have some edible flowers right in your flower garden! This is so pretty. I would never think to decorate a cake with real flowers, but it looks like I would have many options. Thanks for sharing this info! Beautiful photos, too! Lovely idea!!! Good topic chosen by you. Voted up!! One of the loveliest hubs I have read. Really pretty ideas, and lots of great information. The photos are spectaualr. Well done, voted up. These are the most beautiful Easter cakes I have ever seen. Easter is the time of year when I long for spring so to combine Easter cakes with flowers are a wonderful idea! I have never tried this before but I can now, thanks to this well written and instructional hub! The photos are stunning and a those cakes must be a winner at any festivity! Thank you so much for all the work you put into writing this useful hub! Voted up, pinned, and sharing! 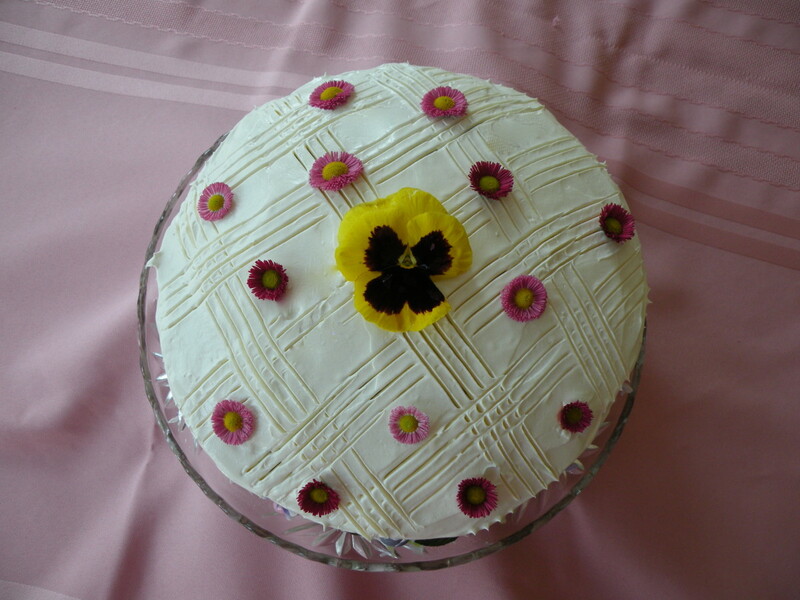 I do enjoy experimenting with cake decorating and especially like the idea of using edible flowers from my garden. Someone who has cake decorating tools can use them to further enhance the cake, but I like using simple tools, like a fork, to add texture to the cake top. Thanks so much for dropping by to comment! I'm glad you enjoyed my ideas for decorating cakes with edible flowers! I find it's a great way of combining my love of flowers with my love of baking. Thanks for stopping by to comment and vote! Thanks so much for stopping by to comment, and thanks for the share! I really appreciate it! I checked the links on my profile page and they seem to be working, but I redid them anyway. If there's anything specific, please drop me an email - thanks so much for the heads-up! Have a great weekend! This is a gorgeous hub, Stephanie. It is making me hungry! I haven't used flowers on anything, although I have seen and eaten a cake decorated with flowers in person. All the cakes you have pictured here are absolutely beautiful - I especially like the ones where you have added the lines in the frosting. Thanks for doing the research and providing the list of edible flowers. I love your cake decoration. They looks so cute and it make the cake more beautiful. Thanks for writing and share with us. Very inspiring hub and useful for us. You come up with great idea. Rated up and pressing buttons, except funny. Take care! Wow, what a unique idea! 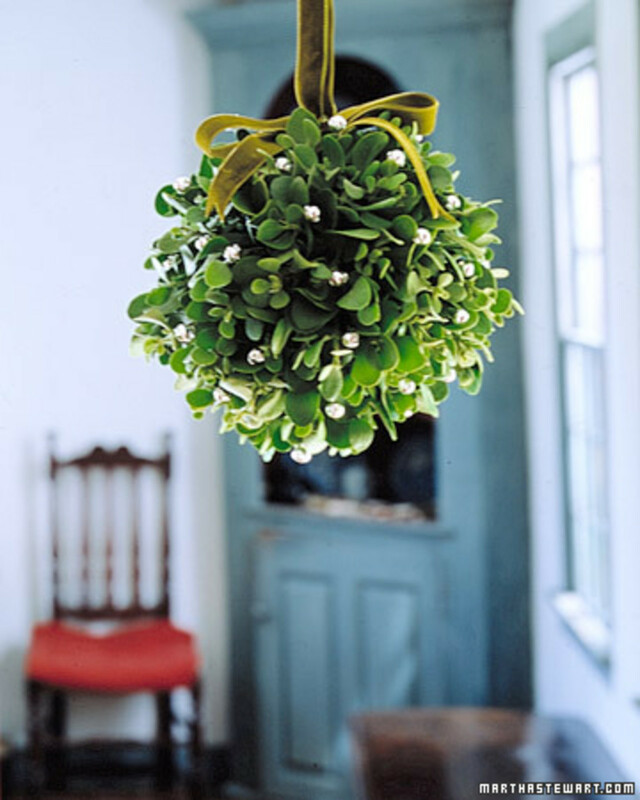 The decorations look beautiful and many flowers actually provide great herbal benefits. Will be Sharing this on Pinterest, Twitter and with followers. ## Also, just wanted to let you know that the links to favorite hubs on your profile are not working. You may want to try editing/replacing them. Some herbs have really pretty flowers that would make perfect cake decorations! 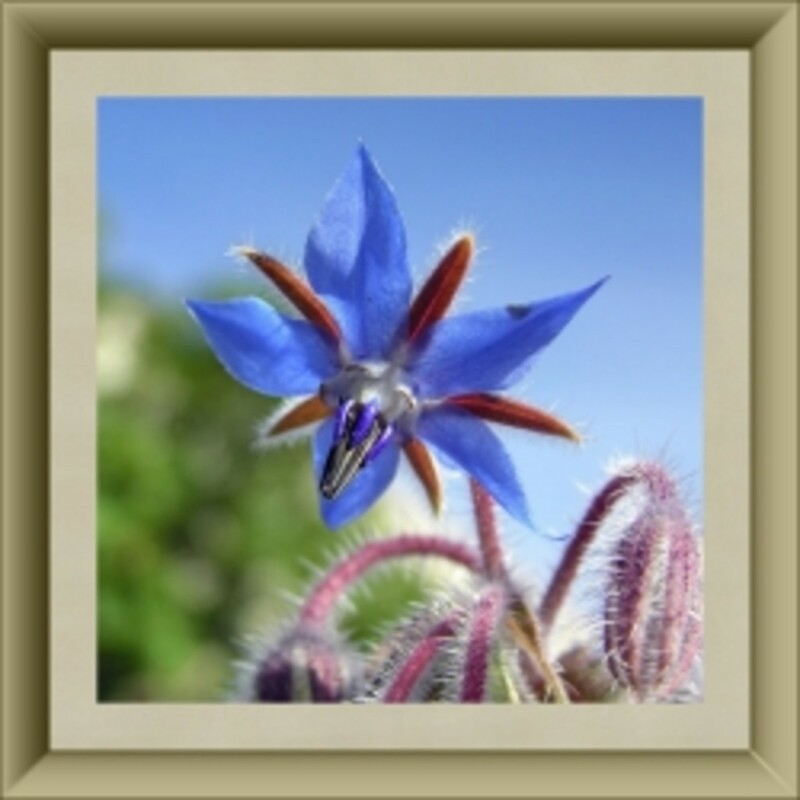 I particularly like the blue star shaped flowers of borage... Have fun experimenting! This is just fantastic, I am really into herbs and natural foods and who knows what all goods are in those blooms. Thank you for the ideas, and so pretty. I have only used flowers in salads or as a garnish. Your cakes that you decorated are so beautiful! Looks like you are a professional cake decorator and if you are not...you could be. Thanks for all of this good information and the long list of edible flowers. Voted up, useful and beautiful. Thanks so much, Pamela99! Decorating cakes with edible fresh flowers is a great way to bring a piece of my garden indoors to enjoy. Thanks so much for stopping by to comment! Decorating cakes with those beautiful flowers makes them very special. I love your pictures and appreciate your instructions. Beautiful hub. Well, my sons always put quantity and quality of food before beauty! But their wives and my grandchildren do enjoy the decorations, too! :) Thanks for stopping by to comment and read! What a gorgeous cake Stephanie. I'm sure your family looks forward to holidays and celebrations with you. Looks really yummy! Using edible fresh flowers to decorate cakes is something I've only recently started to do. Now I'm really into making crystallized flowers for use in the winter when I can't go out to my flower garden and pick some posies. Glad you liked the ideas presented here. Thanks for stopping by to comment! Beautiful cakes!! I love the idea of using fresh and crsystallized flowers for decorating. I decorate a lot of cakes throughout the year, and having something other than fruit and chocolate is a welcoming idea. Thank you! Gypsy48 - I do enjoy looking at beautiful cakes, too, but somebody has to eat them...might as well be us! :) Thanks for stopping by to comment and vote! Beautiful cakes! Almost too beautiful to eat. Voted up and awesome. So glad you enjoyed my hub and that it might inspire you to try decorating with edible flowers. Thanks for stopping by to comment and thanks for sharing! I love the idea of adding rose petals to a salad! I will definitely try that when my roses start blooming! Thanks for the idea, and thanks for stopping in to read and comment on my hub!